To create a floor that’s both beautiful and durable takes a strong back and a skillful eye. Flooring installers and tile and marble setters tackle the job—laying and finishing carpet, wood, vinyl, and tile. Work starts by removing old flooring then cleaning and leveling the surface. These workers measure the area to be covered, and cut flooring material or tile to fit. Relying on design plans—or their knowledge of attractive patterns and colors— they place tile and flooring and affix it in position. 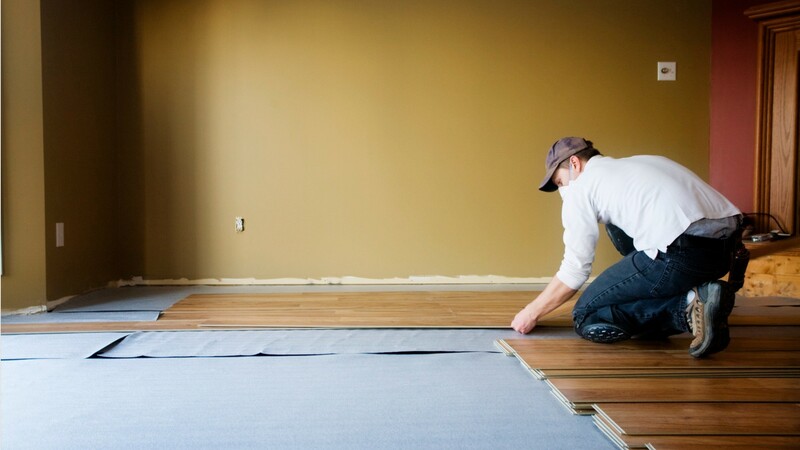 Each type of flooring requires its own skills and tools to install: Carpet installers use “knee kickers,” to position carpet, and power stretchers to pull it snugly against walls. Floor sanders and finishers power sand hardwood floors, then apply stains and sealants to preserve the wood. Floor layers install durable linoleum, vinyl and other materials. Tile and marble setters use special cutting devices to size ceramic and marble tile, then install it and finish the floor surface. The work of installing flooring comes with challenging physical demands; workers spend much of their time reaching, bending, and kneeling, and wear protective equipment when needed. Most schedules are full time, and self-employment is common. Most flooring installers and tile and marble setters learn on the job starting as helpers, though some enter the field through a 2-4 year apprenticeship. Scrape and sand wooden floors to smooth surfaces using floor scraper and floor sanding machine, and apply coats of finish. Scrape and sand floor edges and areas inaccessible to floor sanders, using scrapers, disk-type sanders, and sandpaper. Guide sanding machines over surfaces of floors until surfaces are smooth. Floor Sanders & Finishers by U.S. Department of Labor, Employment and Training Administration is licensed under a Creative Commons Attribution 4.0 International License.